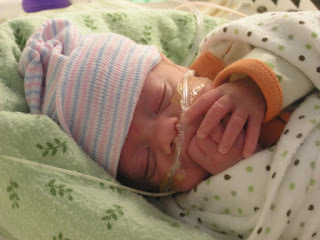 We are thanking God again for His blessings- Liam has been on only 21% oxygen since my last post! The Dr. is very happy. Room air is 21% oxygen so that means Liam is breathing just what you and I do! He still has the cannula as his little body isn't ready to go off of it yet but he is doing really good! When I went in yesterday he had the cannula in his hand down by his chin and he was satting 95 and sound asleep. Which means he wasn't even using the cannula (breathing all on his own) and he was doing great! When I checked on him this morning his nurse said he didn't even desat last nite!!! He still needs to gain weight. He is very slow at doing that so we need to see him gaining a good amount of grams per day. He is tolerating his feedings with the formula added to the breast milk really well so they will probably boost it by another two calories this next week making it 24 calories per ounce. He gets 26 cc per feeding which is just less than an ounce. I am still praying for the earthly impossible which is getting home this month with Liam.... but we know with God all things are possible so we continue to pray for that. The hospital thinks is will be March as long as everything continues to go well. So- the prayers are for continues progress with his weight and strength, continued progress with his low 02, and no setbacks-illness,infection, etc...!! I love the pictures that you post of Liam. He is so adorable! Praise the Lord for the great news! We will be praying that he will be able to come home very soon.I know you will be so glad when all of your family is back together. Praise God! That is wonderful! It brings tears to my eyes. We will continue to pray.I'm so excited. I just know he will come home real soon. I love that picture of him...He looks like he has a secret! I posted a picture of Liam on my Flickr account with a link back to your blog. I just wanted to let you know in case you wanted to read any of the comments that people have left for you and your family. Keep the faith - your prayer chain is getting bigger every day.